I have a confession to make. 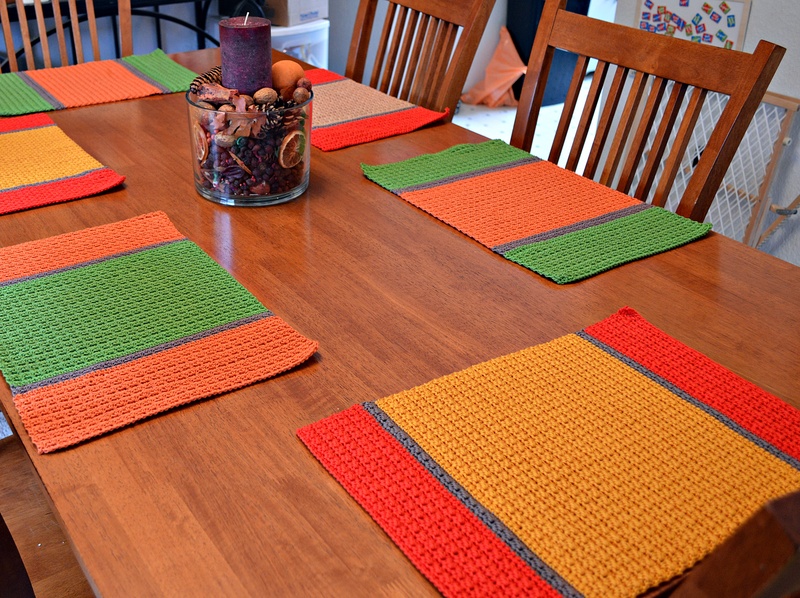 I love setting a table with placemats and cloth napkins. I don’t do paper plates or napkins unless we’re camping and even then I use plastic plates. I have placemats for most seasons, more for Christmas and a fall than anything else. Fall is my favorite time of year. I love the colors of the changing leaves, the sharp frosty mornings turning into warm sunny afternoons and the smell of woodsmoke drifting in the wind. 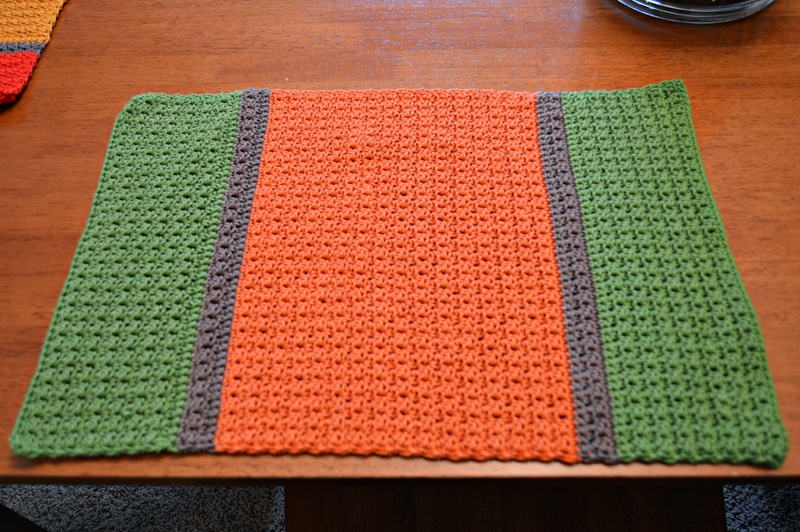 I never seem to have enough placemats and didn’t like any that I saw so I did the usual Pinterest search and found a beautiful crochet color block placemat pattern. But I wanted to change up the color placement a bit and only use three colors instead of four. The pattern is such that you can change it up any way you want, with any number of colors and/or arrangement of colors. 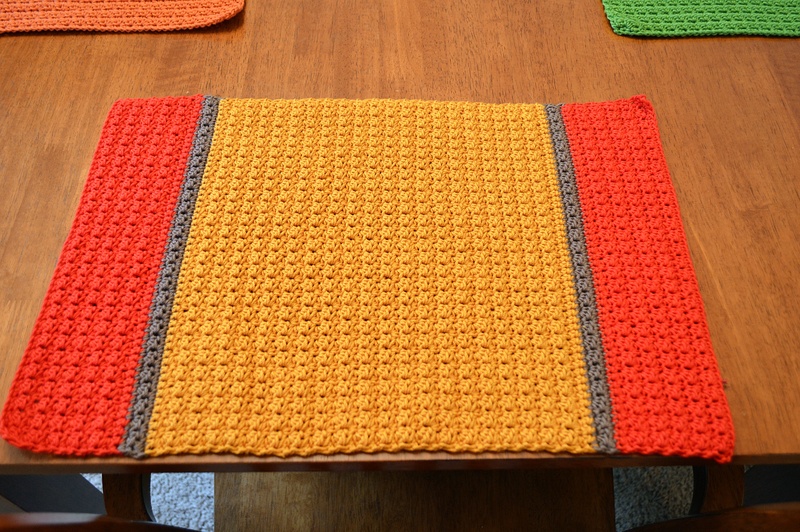 I used Lion Brand 24/7 cotton yarn and I love how the placemats turned out. The yarn is 100% mercerized cotton which gives the finished product a beautiful sheen, unlike other cottons which are rough and dull. I love the texture the combination of stitches makes. The placemat isn’t too rigid but still lies flat. I also made another set in blue, yellow and white for summer. Just haven’t finished the dreaded weaving in of ends. I’ve been looking at all of the color choices in the 24/7 and trying decide what colors to do next. I have a few ideas in my head already for the 4th of July.